With detailed planning and execution by an experienced agency, social media marketing (SMM) can be a valuable channel within integrated marketing campaigns, complementing and enhancing the results from other efforts. With the explosion of social media in recent years, brand marketers and agencies are struggling to figure out how SMM fits into the total interactive marketing and advertising picture. Can SMM be effectively worked into the mix as part of an integrated marketing campaign? 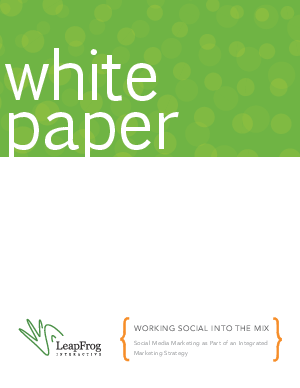 Read about how to effectively work social media marketing into the mix in this white paper.